My family and friends are, without a doubt, what get me through life. I’d be pretty lost without them. I have an extremely supportive family, who have not only helped me through recovery after surgeries many times, but are there for me on a day to day basis – helping to carry things I cannot as I’m using crutches, getting things for me when they’re out of reach, they drove me to places I could not walk to (before I had a car of my own!) and many other ways. They understand that some of the small things in life can cause difficulty for me and they try to make things as easy for me as they possibly can… which they’ll never realise how much I appreciate (well, Mum might do once she’s found this post!). They’ve kept me company and provided entertainment when I’ve been stuck in bed after surgery, they have made me smile when my self confidence has been low, and most importantly, they make me feel 100% accepted. What I’m trying to get across is how important strong family bonds and friendships can be. There will be times when physically, life is difficult, but also times when emotionally, things can get a little too much for you… and it is in times like those that you really need people around you who understand how you’re feeling. I don’t know what I would have done in many situations throughout my life so far, if I hadn’t had the support of those around me… so I’m putting it in writing now, to say a massive THANK YOU to everyone who has put a smile on my face and is a true friend to me. I know it sounds cheesy, but I mean it! I Can See You’re Staring, and Yes I Heard What You Said! Besides the obvious frustrations of living with Pseudoachondroplasia, what I find most annoying (and upsetting sometimes) is when people stare. Yes, I am shorter than most people my age, and yes, my legs are disproportionate to the length of my torso, and yes, I do have to use crutches otherwise my stride isn’t smooth, but I am just as observant as anyone else, and I do notice people staring. And commenting. The amount of times I’ve heard ‘look at that girl, she’s really short’, ‘wow, she’s small’, ‘look at that midget’ and all sorts of other height related comments! I’m not deaf, I CAN hear you! The most appalling thing is that it isn’t always children that say these things. If it was, I could understand – but when a teenager, or an adult says it, I am less than impressed. Surely by the time you’ve spent a few years on this planet you would have acquired a little respect for others, or some sensitivity?! Obviously not. I have challenged a few people in the past, asking them what exactly it is they find so fascinating about me, because I’ve noticed they’ve been looking for an awfully long time – it results in them blushing, feeling very awkward and an embarrassed ‘sorry’. The point is though, I shouldn’t have to do this. This is turning into a bit of a rant, which I didn’t want it to be…! I will stop going on now, for fear of making this post one fuelled with anger, but what I wanted to get across was that I think it’s wrong that people stare and point. It’s rude. It’s hurtful. It shouldn’t be accepted. I would far rather someone approached me and asked why I was short than to have them point and whisper… I would be more than willing to explain if someone was curious! But if you’re unwilling to talk to the person you’re talking about, then don’t talk about them. It’s difficult enough facing problems brought about by disability without having others pointing them out! Shopping for clothes and shoes is one of the most frustrating experiences for me. I can spend hours and hours browsing shops for items to buy, and will still go home with very little. Not because I have no interest in filling my wardrobe with beautiful garments, but because with a body like mine, very few ‘fashionable’ items will fit how they should. I have stopped wearing trousers for instance, because if I buy a pair, I can’t just wear them… they have to go and be altered to be the right length. Jackets won’t fit because the bulky muscle in my arms means all the sleeves are too tight. Even skirts can be an issue as my curved spine means they stick out too much at the back. And shoes?! I just wish I could walk around barefoot all the time. The length of my feet would suggest I should be wearing a UK Size 1 shoe (yes, a child’s size!) but the width of them is so much that these shoes would never fit. This leaves me with two options. 1) Pay to have shoes made especially for my feet. I have done this once, but at quite some cost, and they still didn’t look like ‘normal’ shoes. Or 2) Buy shoes that are too long, but are wide enough to fit my feet in. That’s what I usually do. I live in size 3 shoes. Well, boots. Specifically Ugg boots. They are the only footwear I have ever felt totally comfortable in, and I wear them every single day. Well worth the £160 they cost me! 🙂 In the Summer, I live in flip-flops, as they can be cut to size if you buy the foam ones. So I have found shoes I can wear, but I just wish I could go into a shoe shop, and buy a ‘beautiful pair of heels’ that would be ‘too high to be comfortable in’ – Just so I could have the same experience as friends my age do. They love shoe shopping, I absolutely dread it. It’s not just the clothes themselves that remove the enjoyment from a shopping trip for me – it’s the shops themselves. I accept the fact that things will be out of reach for me, as shops are set out for customers of ‘average size’, but it is SO annoying having to ask someone to reach things on my behalf. It does put me off even looking at some things properly, just to save having to ask for help. It’s silly really! Of course, the pain that comes with standing up or walking for too long probably doesn’t help how I feel about browsing shops. It does somewhat ruin the possibility of a ‘girly day shopping’. Then again, it’s a good excuse to go into another café! 😉 It’s just one of the small things in life which for most people are enjoyable, but the challenges Pseudoachondroplasia throws at you can ruin a little. Not the end of the world at all, but it is irritating! So the plaster cast was taken off my right leg in December – to reveal my perfectly straight leg, excellent! A follow up appointment was booked for three months later, in March of this year. The question I knew I was going to get from my surgeon was (as I entered his office) ‘Ruby, why are you still using crutches?’. I had wanted to be off crutches within a few weeks of plaster removal, to build up muscle and strength, but this hadn’t happened. I was unable to bend my knee past 90 degrees, no matter how much force I put onto it – and this made walking without an aid difficult, and walking up stairs? Impossible (You need 115 degrees of bend to use stairs unaided. According to something I read online!). There was another reason I hadn’t ditched the trusty crutches too – sharp pain in my hips – but I decided not to add that into the equation when I replied, ‘Oh, because I can’t bend my knee enough to walk with ease’. With that, I was told to lie on the examination bed, whilst he tried to force my leg past the position I said it got stuck in… No Luck. Apparently it’s a ‘mechanical jam’. So off to the x-ray department I went, to see what this jam was. A few x-rays later, and it was revealed that the reason I cannot bend my knee is because the two bones are locking up against one another. Since the frame went on, the knee joint has become misshapen. Obviously, I ask what can be done about it, and he says he’s not sure. NOT SURE?! Aaaah! But, he is referring me to see two knee specialists next month to see if they have any ideas… Oh, I really hope they do! Having a leg that won’t bend much obviously isn’t the end of the world, but it is an inconvenience! Once that was cleared up, I decided to just drop into conversation that my hips had been hurting quite a lot too. Another look at the x-ray, and he said (and I quote) ‘Yep, you’re stuffed – to put it nicely’. haha! I do love how blunt he is about it! Comparing the x-rays from December, to the ones taken in March (just three months later), the bone of my hip has worn away quite considerably, which is why they are hurting so much. Apparently I will be needing hip replacements in the not-so-distant-future. I’m not impressed. I was aware that hip replacements are a common thing for people with Pseudoachondroplasia, but I thought I would have until I was at least 30 before they were needed! I’m 20! That’s 10 years too early!! I have plans for my life, in particular, to further my education at University doing a PhD or Masters, and to get my career kicked off – how am I supposed to just fit in the surgery and recovery time for a couple of hip replacements?! 😦 But, it’ll have to be done, somehow. The first frame came off in 2008, leaving me with one very straight left leg with lots of small circular scars all over it, and one almost-straight right leg which still bent backwards when I walked. 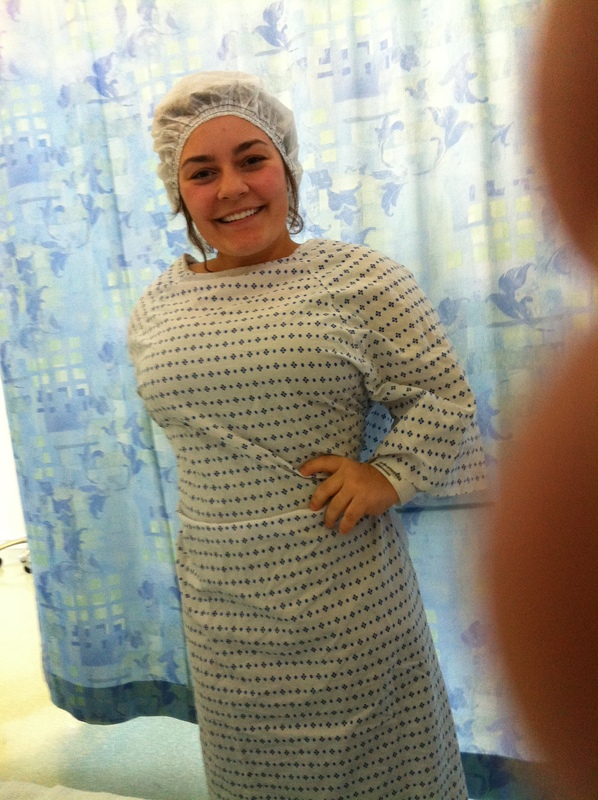 So, in 2011, having had three years to forget what it is really like to be framed up, I visited my surgeon once more. An appointment in April to ‘discuss what options there may be in the future’. I got a bit carried away and booked myself in for that June to have my second frame fitted. On June the 20th 2011, I went into hospital at 7am. At 5pm (by which point I hadn’t had a drink or any food for 18 hours, I was soooo hungry!) I went down to theatre, was given a general anaesthetic and drifted off. I think the operation took around 2 and a half hours (but I was so drowsy I don’t think checking the clock was high on my agenda!). Dosed up on painkiller and still half asleep after the anaesthetic, I just slept until the next day. I asked to be taken off the intravenous drip of painkillers, which the nurses agreed to as I had been through this procedure before. On a few paracetamol a day, I quickly progressed through the checklist of things you’re required to do before you’re allowed home! Get up, washed and dressed? Done. Change the pin-site dressings? Done. Walk up and down the ward using crutches? Done. Pick up the prescription of painkillers? Would have done, but it was going to take hours, so I said I’d get some from Tesco instead – after all, I wasn’t taking anything unusual! So, I beat my personal best. I was ready to leave the hospital just three days after the frame was fitted! Four days sooner than expected! Yippee! The 5 months that frame were on dragged by. Each day, hardly moving, not feeling up to many outings out (not because it hurt, but because I got sick of people staring at the frame in disgust – as though I shouldn’t be out in public!). I watched enough television and DVDs to last me a lifetime! 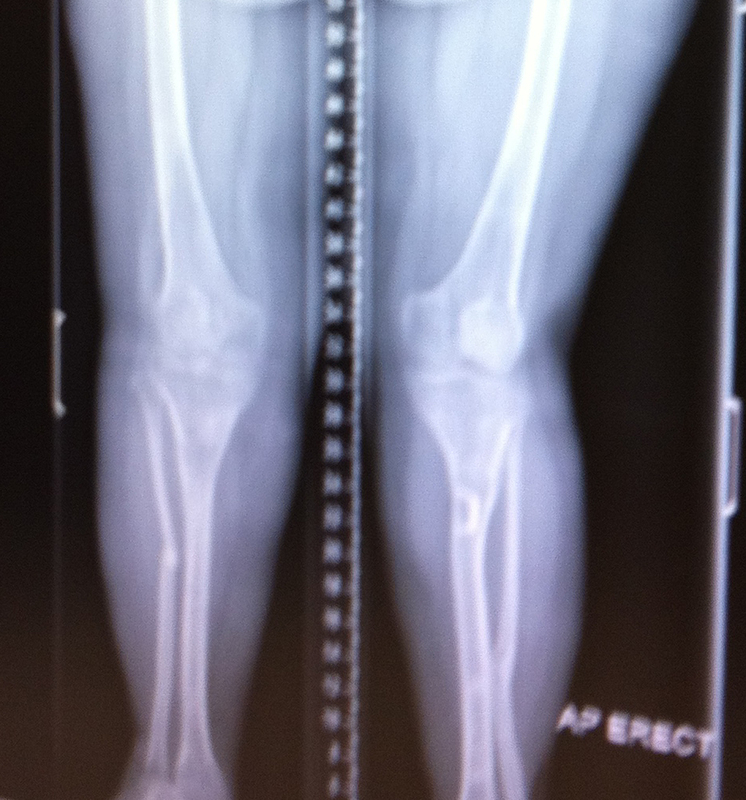 Exactly 5 months after the frame was fitted, x-rays showed that the bones were healed enough for frame removal. So that’s what was done. Frame off, plaster cast on. One month to go! Having a leg in plaster cast really isn’t much of an inconvenience at all. I could wear normal clothes, I could move around without pins tearing through my skin, I could have a shower without having to spend ages seeing to all the pin-sites after – and I could go out and about, which certainly made time pass faster!